Now here’s a really cool and clever reinvention of the humble light bulb, and it’s currently “going off” on crowdfuding site Kickstarter. So far the LIFX project has raised over $550,472 (as of writing). 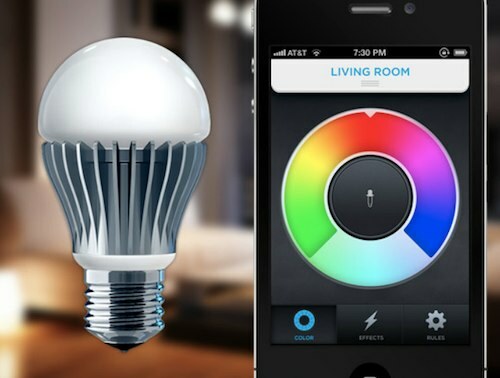 LIFX is a WiFi enabled, multicolour, energy efficient LED light bulb that you can control from your iPhone or Android smartphone. Check out the video below to see it in action. It’s pretty damn impressive, so no wonder the project is having a ton of crowdfounded money thrown at it on Kickstarter. I think part of the appeal of this bulb, even though it’s likely to be expensive on first release (but most new tech gets much cheaper over time), is that it seems really easy to install. All you will have to do is replace an existing light bulb and download a free app for your smartphones in the usual manner. Nothing else needs to be physically installed. That’s a huge bonus when it comes to new technology. Another big part of the appeal I’m sure is that it’s multicoloured. In fact, you can change the colour of the light to any colour in the RGB range from the comfort and convenience of your sofa and smartphone. Now, if you’ve got your tv remote, smartphone, and laptop, you may never have to leave the sofa, unless it’s for a bathroom or fridge visit. Hmm, there must be a another Kickstarter opportunity in there somewhere? But seriously, the LIFX also does a lot of other cool and useful stuff, including turning your lights on and off automatically, dimming them over time (say for your kids’ nightlights), and creating mood lighting that matches the beat of music. Oh, and I almost forgot to mention, it’s pretty eco-friendly because switching to LED makes lighting very energy efficient. It’ll use about 10% (!) of the energy of standard bulbs, and the LIFX bulb is apparently rated to 40,000 hours, that’s 25 years.